Peter first came to Bath for a year in 1986 to study an art foundation course. He went on to graduate from Manchester Polytechnic remaining a further two years working in a studio in Ancoats, an area just north of the city centre. He then studied a PGCE in FE in Eltham, London before giving up painting. Returning to Bath in 1993, inspired by the architecture and life of the town, he started to draw in charcoal moving back to working in oils three years later. And it was on the streets of Bath Peter began to earn his living and it was here he earned the nick name ‘Pete the Street’. 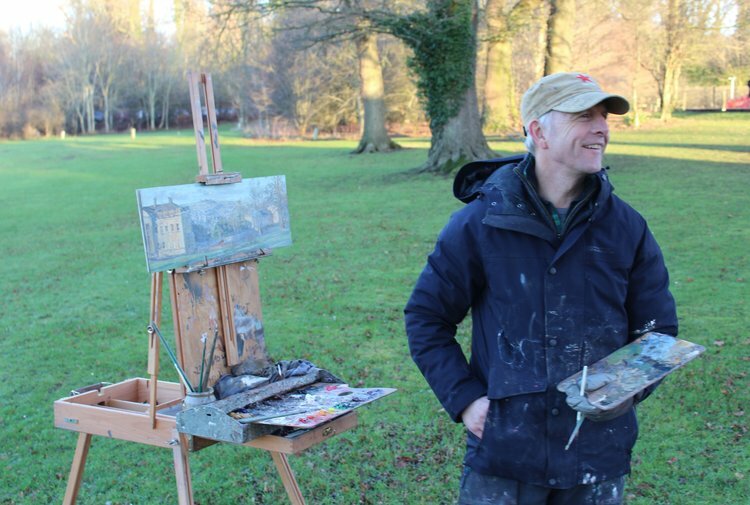 Peter paints a great deal across the UK – its cities, landscapes and coastline and in particular London. However, discovering new places has become more and more important and his painting has taken him further afield to India, Vietnam, Havana, USA and across Europe. He rarely paints from reference in the studio preferring to work directly from the subject on site in sometimes the foulest of weathers doing what he calls ‘see and put’. Recently however, Peter has become more interested in interiors – of his home in Bath and elsewhere. Working in charcoal, oil paint and pastel, he has received numerous awards at various national exhibitions. Peter paints for one-man exhibitions each year either in London or Bath and has been showing with Messum’s, London since 2004. He is a passionate member of the New English Art Club, an elected society of contemporary painters whose ethos resides in art informed by the visual world and personal interpretation. The ‘New English’ was founded in 1885 by a group of artists dissatisfied with the entrenched attitudes of the Royal Academy. So they mounted their first show in 1886 including paintings by Clausen, Sickert and Stanhope Forbes. In 2018, Peter was elected president to the Club. Peter is also a member of the Royal Society of Portrait Painters, the Royal institute of Oil Painters, the Pastel Society, Bath Society of Artists and an honorary member of the Royal Society of British Artists. Peter lives is Bath with his wife Lisa and their five children: Ollie, Toby, Hattie, Ella and Ned. Pete the painter shot on a Nikon D3s from Lee Curran on Vimeo. 1997-99: Mixed shows: The Albany Gallery, Cardiff the Alresford Gallery, Alresford, Beaux Arts, Bath and Island Fine Art, Isle of Wight.